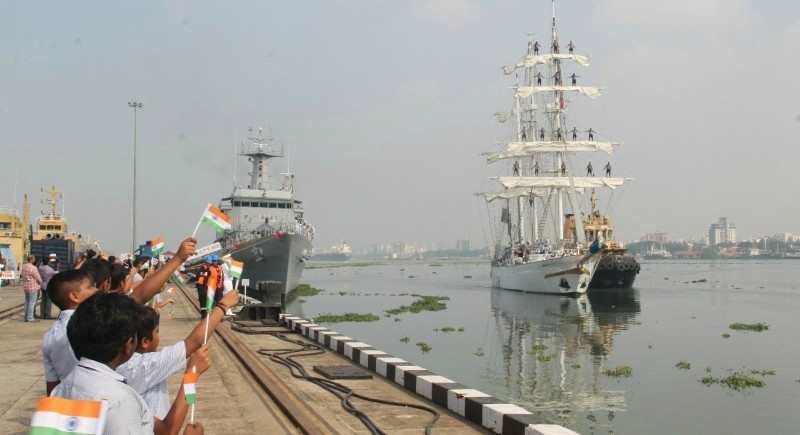 Kochi, October 30: Accomplishing the seven month long voyage across the world, the sail training ship of Indian Navy, INS Tarangini returned at the Kochi port this afternoon. Proudly waving the Tri Color, the ship highlighted the diverse culture of India across 15 ports in 13 countries. The Voyage named “Lokayan 18” was flagged off on 10 Apr 18 from Kochi. The ship sailed across the Arabian Sea, Red Sea, Suez Canal, Mediterranean Sea, Strait of Gibraltar, North Atlantic Ocean, and other ports right up to Norway before commencing her homeward passage back to Kochi. The ship also participated in the culminating event of the ‘Three Festival Tall Ships Regatta’ at Bordeaux, France along with the ‘Tall Ships Races Europe 2018’ which started at Sunderland, UK. The ship along with hundreds of other sailing vessels, of which 200 were ‘Tall Ships’ like herself, besides taking part in the parade of sails, which was conducted at all these ports. INS Tarangini is a three masted 'square rigged' barque which carries a total of 20 sails. She is the First Sail Training Ship in Indian Navy and was commissioned on 11 Nov 1997. In her 21 years of glorious service, she has sailed over 2,20,000 nautical miles to date across the world's oceans. Over the years, INS Tarangini has been extensively deployed for long voyages away from her base port of Kochi, which includes one circumnavigation of the globe (2003-04) and three previous ‘Lokayans’ (2005, 2007 and 2015). Under the command of Cdr Rahul Mehta the ship has a crew of nine officers and 43 sailors and can also embark 30 Officer Sea Trainees. She is the first of two Sail Training Ships in the First Training Squadron, the other being INS Sudarshini. The primary role of these Sail Training Ships is to develop character and professionalism, as well as inculcate the qualities of initiative, courage, resilience and esprit-de-corps amongst the Sea Trainees and also impart practical training to them, primarily on navigation, sailing and seamanship.